On 3 October 1226 St Francis died in Assisi. Just two years later, in Lucca, to the east outside the medieval walls, the Friars Minors began building their convent. There arose a church dedicated to St Mary Magdalen, the initial nucleus of a complex that gradually grew in size and importance as the result of donations and legacies. Although at the edge of the city, the Minorite convent soon became a gathering place for the powerful as well as the poorest, so much so that it became a nuisance for the local bishop. Always independent in their choices, in 1328 the Franciscan friars performed solemn exequies for Castruccio Castracani degli Antelminelli, the dead Ghibelline mercenary captain who had been twice excommunicated by the pope. His mortal remains still lie buried in the church, in a funerary monument next to those of Lucchese nobles, members of the Order and ordinary citizens. San Francesco was chosen as the civic pantheon: it was here that the leading Lucchese families chose to be buried, beneath tomb slabs or in richly decorated chapels. Prominent among these families were the Guinigi, who had their chapel in the convent and became its principal administrators and benefactors. The growth in the numbers and importance of the Franciscan community was the reason for successive enlargements of the church, which from 1335 is mentioned in documents as Sancti Francisci de Luca , and of the Convent, which from a single large rectangular cloister in the fourteenth century became a large architectural complex consisting of three cloisters with conventual cells, common spaces, service quarters and, especially, places for Studio . The cultural prestige of the Minorite Convent of Lucca was constantly in the ascendant. In 1532 the Cronache describe it as a Studio Generale , i.e. capable of conferring degrees. In the 17th century it received the ‘Faculty of Philosophy and Theology’ and thus became a Studio di Prima Classe . Its international cultural importance did not however affect the presence of the Friars Minors in the social life of the city. In 1531, while Lucca was devastated by famine and by pellagra, the Tumulto degli Straccioni , the historic revolt of the oppressed and underpaid silk-workers, took its beginning from the church of San Francesco. A century later the Friars were again involved in succouring the beleaguered population: the Plague claimed numerous victims, and many priests of the Order died while ministering to the sick. When on 2 December 1630 the first case of contagion occurred in the convent and the whole complex was closed down by the health authorities, the Friars stepped up their academic activities and founded the 'Accademia dei Racchiusi', promoter of arts, sciences and letters. The 18th century opened with imposing works of restoration and amplification in accordance with the stylistic dictates of the period. But the large windows of the church, financed by the Guardie Svizzere di Palazzo, were insufficient to illuminate a century of increasing darkness. Relations with the Lucchese magistratures deteriorated over the questions of the Friars’ right di dare medicamento. Moreover, the Archbishop’s order that all funerals take place in parish churches compromised the Convent’s revenue. The coming of the principate of Napoleon’s sister Elisa Baciocchi and of her health reforms caused a temporary removal of the Franciscan community, as the Convent was requisitioned for use as a Grande Reclusorio. Not until 1818, after the fall of Napoleon and the arrival in Lucca of the Bourbon Duchy, were the Franciscans able to re-enter their Convent. A few decades later the Unification of Italy ushered in a period of tremendous difficulties for the immense national religious patrimony. Like many other religious institutions, the Convent of San Francesco was occupied on account of ‘imperative military necessity’. The confiscation of the complex by the State was deeply resented by Lucchese public opinion: popular committees were immediately formed, petitions were drawn up and protests made. 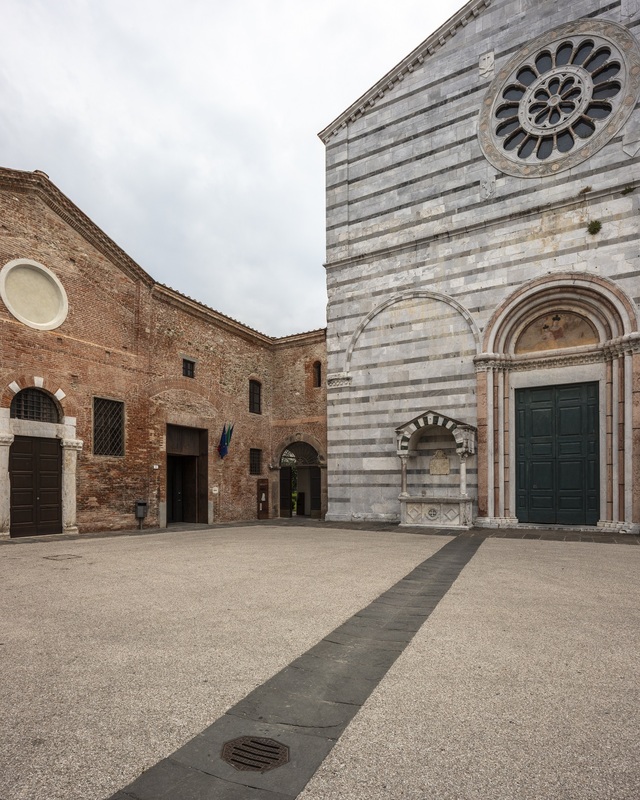 Only after extensive negotiations did the Ministry of War accept a proposal that, in exchange for the buildings of Sant’Agostino, the church should be granted to the Comune of Lucca while the convent was sold to the Opera Pia di Terrasanta. The Friars re-entered a church that had been severely damaged by improper usage and they immediately set about restoring it, with the help of numerous financial contributors. In 1927 the façade was completed to a design by Orzali, in a neo-medieval style that seeks to obliterate all traces of recent centuries. It was in that year that the civic pantheon idea was revived, with the burial of the ashes of Luigi Boccherini, the Lucchese composer who died in Madrid in 1805. After the Second World War, the new laws of the Italian Republic caused significant changes to the Convent’s educational programme. The Friars concentrated on pastoral activity. In the later 20th century the spaces were partially alienated to private individuals, rented out or used for community welfare purposes. The Convent of San Francesco, on the threshold of the new millennium, sank into its demise together with its aged and bed-ridden representatives. In the year 2003 the Tuscan Province of the Friars Minor announced that the complex was up for sale. 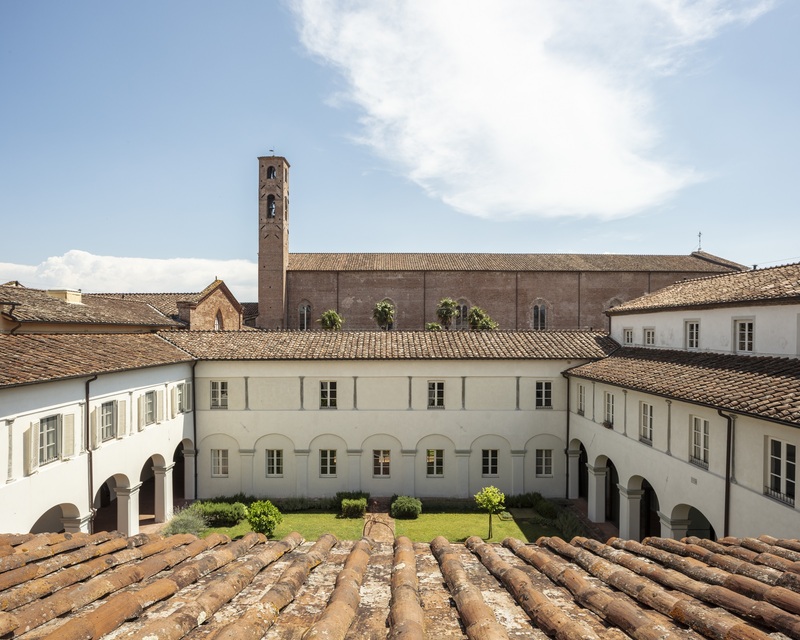 Meditation, study, hospitality: this is the historic identity of the Convent of San Francesco, ably interpreted and re-proposed in an architectural restoration of great aesthetic value but even more admirable for its living witness to history. The place of Franciscan theological and philosophical studies has today become the centre for the university institute IMT Alti Studi. This result has been achieved in eight years of work thanks to the fruitful synergy between the Comune, the Fondazione Cassa di Risparmio di Lucca and the Soprintendenza per i Beni Architettonici. There are over 12,000 square metres of space for the IMT campus, the Library and the administrative offices in the nearby complex of San Ponziano. One hundred beds, comprising single and double rooms as well as mini-apartments, are concentrated in the north portion. The ‘Ca nova’, formerly used for storing grain and other foodstuffs, has become the canteen. 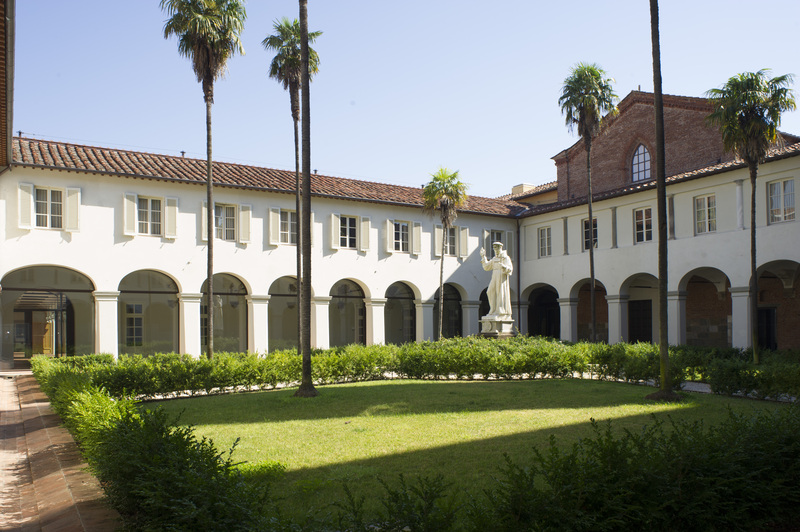 Numerous study rooms are located in the former library, refectory, church of San Franceschetto and old sacristy. The Guinigi Chapel is furnished as the Aula Magna, seating 120. Equipped with the most fittings, it can at any moment be returned to museum appearance. The perfumes, essences and colours of the intimate conventual spaces are recovered in the cloisters. The porticos have been partly glazed in, to ensure privacy and silence during study time. Partly, on the other hand, they assume a public character, becoming a tract of the new urban route that links Piazza San Francesco with the Giardino degli Osservanti and the Mazzini car park. The church, a marvellous example of the Mendicant Order’s religious architecture, now contains an auditorium for over 500 people, while retaining its works of art. Traces of frescoes, mural decorations, inscriptions and marble fragments, colours of canvas and extensions of structures are some of the secrets revealed during the restoration, together with the itineraries among the buried walls and the tombs, explored during an exhaustive archaeological campaign conducted in the ‘hidden stratum’ of the San Francesco complex. Eight centuries have been re-read in eight years of restoration, for a renewed dialogue with history. 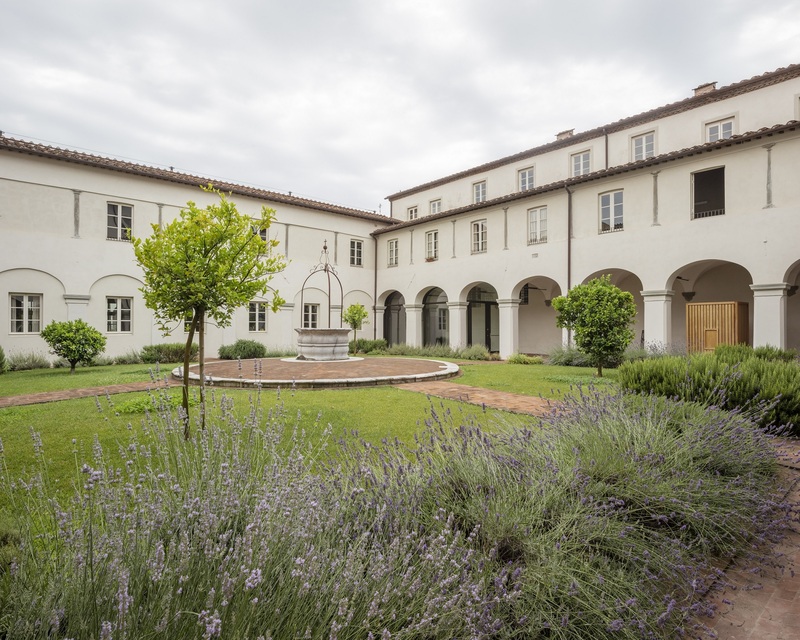 The spirit in which young people flock to Lucca to complete their education is not so different from the thirst for knowledge that drove the Franciscans of the Middle Ages to travel from university to university and from convent to convent. To arrive in Lucca is, often, to settle here. A stroll around the cloisters of the complex of San Francesco is a means of re-living the atmosphere of culture an meditation that even today, after eight centuries of history, permeates the ancient walls of the Convent. We enter through the little door on Piazza San Francesco and we pass many marble tablets on the wall, conceded as memorials to dead relatives in exchange for donations to the Convent. The most recent of these tablets date from the 19th century, the earliest from the 14th. One Latin inscription records Betta Corbolani, daughterof Castruccio Castracani, whose tomb can be recognised by the processional cross between the coats of arms of the two families. Even older is the sarcophagus tomb set into the wall and surmounted by a lunette decorated with the Virgin and Child . The inscription gives a date, 1274, and the name of the deceased, Bonagiunta Tignosini. Our route takes us to the gardens at the back, through three cloisters. 17th-century documents inform us that in the first cloister the Friars Minor grew vegetables to feed the poor, in the second cloister oats were grown for the mules, while the third cloister was partly reserved to the Father Apothecary for his herbs and simples and partly to the Father Sacristan for altar flowers. In the centre was a water cistern, where today we see the well. The sainted Founder of the Order is commemorated by a statue now placed in the centre of the second cloister. The church of San Francesco , with its aisle-less nave terminating in three aspidal chapels, follows the typological canons of the churches of the Tuscan mendicant orders between the 13th and 14th century. The principal façade, revetted in bichrome horizontal bands, presents a lower register dating from the 13th century and an upper one that was completed in 1927 to a design by the architect Orzali. Two arches at the sides of the entrance doorway decorate the façade: the one on the left, dated 1224, was erected in honour of Ricciardo Ricciardi; the one on the right was set up by the Bettori family but the date is illegible. The central rose window with the four coats of arms is part of the restructuring carried out in the Fascist period. Inside, the ten altars disposed along the side walls, many of them lacking their original altarpieces, are the result of an internal restructuring between the 16th and 17th century. Also of the 17th century is central aspidal chapel, with a rectangular plan, built to contain wooden choir stalls that have been lost and replaced by the ones visible today. There are numerous tombs and funerary monuments. On the right wall of the nave remains can still be seen of the pensile sepulchre that contained the heart of Nino Visconti, Giudice of Gallura, whom Dante in his Divine Comedy consigned to Purgatory. Also noteworthy is the funerary monument to Giovanni Guidiccioni, papal legate, poet and humanist, who died in Lucca in 1541. There is a monument to the composer Luigi Boccherini and many inscriptions recording other illustrious citizens. Heraldic insignia and inscriptions are also to be found on the tombslabs set into the terracotta pavement.